Capital Air Services: High speed, luxury private helicopter charter – Trusted. Professional. Discreet. Many of us strive for a work life balance but achieving it is no easy feat. Chartering a private helicopter as a form of executive travel facilitates a more productive working day, saving on time spent travelling to and from meetings and, most importantly, getting home to family. It has been reported that recently the UK has the highest volume of private charter operations in Europe. More and more high net worth individuals recognise the convenience and many benefits of travelling privately by helicopter. On average, using helicopters as a mode of executive transport reduces travel time by at least 2/3rds compared to ground transportation. Flying from Oxford to London Heathrow or Luton airports is reduced to just twenty minutes travel time. A familiar sight at race and golf courses, Capital Air Services immaculate corporate helicopters are fast being recognised as a quick and stress free way to travel to and from popular social and sporting events too – beating the inevitable grid lock, arriving on time and most importantly spending less time away from the family is always bonus for those with hectic schedules. You can fly from London to Ascot in just fifteen minutes! With an immaculate EC135 Airbus helicopter just added to their fleet and a new pilot currently undergoing the extensive pilot training, Capital Air are in a good position to meet the growing demand for private charter. All Capital Air Services pilots are highly skilled and operate under the exacting requirements of the company’s CAA approved Air Operators Certificate ensuring the highest standards of safety and service to the customer. Operating for over 25 years, Capital Air Services offers a 24/7 luxury, bespoke service across the UK. Its modern and sophisticated fleet of IFR capable, twin engine Airbus and Sikorsky helicopters are fully equipped for day and night flying, essential when events and meetings overrun in to the hours of darkness. This is a key consideration when booking a private charter, and something not all companies offer. Twin engine helicopters are capable of flying above cloud so reducing the risk of flight cancellations due to adverse weather conditions therefore enhancing safety. Frequent flyers may consider the purchase of their own aircraft which can start from as little as £85k ranging to £10m. Capital Airs provision of management and pilot service frees owners of running their own flight operation leaving them to enjoy the benefits of helicopter travel without the worry and with the option to offset some of the operation cost. Owner of Capital Air Services, Michael Hampton and his dedicated operations team, are on hand 24/7 to find the best charter flight solution for you in terms of cost and convenience and for those interested in purchasing your own aircraft, Michael would be happy to guide you through the best purchasing process and suggest the best helicopter for your needs. MOA: When did you career start in aviation? And Did you always want to be a pilot and what was your career path to becoming a pilot? Michael Hampton: No, it did not occur to me until doing army foot patrols in Northern Ireland that I realised that the helicopter pilots had a much better job than me so I applied for Army flight training, one of the best decisions I have ever made. MOA: Where did you get the idea to set up Capital Air Services? Michael Hampton: I was working for a major aviation company when I had the chance to take over a small helicopter traffic watch contract for a local Oxford radio station. We flew every morning for nearly 10 years as the Flying FOX. MOA: What where the Challenges? Michael Hampton: One leased helicopter, one pilot and one contract. I was both cook and bottle washer but it was fun and I had a great sense of excitement and freedom. MOA: How did you overcome the challenges? Michael Hampton: I had to get more helicopters under my management and provide a service both to the helicopter owners and to the charter passengers. I worked with some great owners and clients who encouraged and supported me and still do. MOA: What is your passion inside and outside your work? Michael Hampton: Helicopter flight is like a magic carpet and takes you where you want to go, when you want to go. I am sure that I bore everyone with my enthusiasm for this fantastic mode of transport. MOA: Where is Capital Air Services based? Michael Hampton: We are based at London Oxford Airport very close to Blenheim Palace. We are ideally placed for London, Liverpool / Manchester and Cardiff being in the centre of England. The Airport provides all the backup services we require to fly day and night. MOA: What’ is your most memorable flight? And can you disclose your most famous client? Michael Hampton: Flying up the ridge of the Pennine Hills on a sunny but frosty morning. Stunningly beautiful and I realised that I really did have the best seat in the house. Who was with me, we never say, client confidentially is a must for us. MOA: Any travel tips for someone who is scared of flying in helicopters? Michael Hampton: Sit back, relax and enjoy the view as you are probably in one of the safest forms of travel available. If it was scary we would not do it! MOA: What question do you get asked the most when on board a helicopter? Michael Hampton: Is it easy to fly? To which the answer is yes ……. but to do it to the level we require of our pilots takes years of commitment and experience. MOA: What do you love about your job? Michael Hampton: The people we meet and the variety of different places we go as we land at beautiful houses, private golf courses and places that are just not accessible to the public. MOA: What’s your least favourite thing about your job if any? Michael Hampton: Waiting for fog to clear so that we can see far enough to get airborne safely. MOA: How many helicopters do you have in your fleet? And what is your favourite one? Michael Hampton: We have an “in house” fleet of 4 with and further 2 that we can call on if necessary. My personal favourite is the EC 135 which is a delight to fly and very reliable as well as being fast and comfortable for both the crew and passengers. MOA: Where was your last flight (to and from)? Michael Hampton: My last flight was last week when I undertook my Annual Flight test with an examiner. You have to be at the top of your game always and is what I demand of all my pilots and I know that they take a pride in demonstrating their skills and professionalism. MOA: What’s the one thing you think will change private aviation in the next 5 years? Michael Hampton: New technology will bring in more efficient and quieter, maybe electric, helicopters with lower running costs hopefully making them more accessible to more passengers. MOA: What advice would you pass on to someone who wants to be a private pilot? Michael Hampton: Go for it as it is a very rewarding career and no bad thing getting paid to do something so enjoyable. MOA: What’s the biggest change in aviation during your flying career? Michael Hampton: The incredible changes in power and capabilities of helicopters has been amazing when I think back to the two seat, petrol driven, flying bug that I started on. MOA: Do you and your pilots have to keep updated on yearly training? Michael Hampton: Yes we have a constant training program that involves actual flying with an examiner and time in a flight simulator where we can very realistically practice the emergencies that we hope will never happen. MOA: If you could fly anywhere today where would it be and why? Michael Hampton: Paris. There are almost no hills between London and Paris so we tend to fly in sight of the ground and enjoy the view of the changing countryside and beautiful houses. MOA: What is your favourite hotel to land in? Michael Hampton: We visit so many wonderful hotels and most are very welcoming and most take care of the pilots as well as the guests…a very important consideration if it is a long flying day. MOA: What’s your favourite city to visit? Michael Hampton: You can’t beat London. Every flight you notice something new on the grown and marvel at how must open space remains to be enjoyed. MOA: How have you grown your client list in the last 25 years, even before the word of social media? And do you need social media? Michael Hampton: Word of mouth has always been a most effective marketing tool but social media reaches a far wider audience and plants the seed of considering helicopter travel and who to call so very important to us. We have an on call team to discuss your travel ideas and make them work for you. MOA: And finally, what do you do outside of work to relax? Michael Hampton: I am blessed with a wonderful family but my son recently summed up my other passions as ‘boats, bikes and birds’ and I go with that! 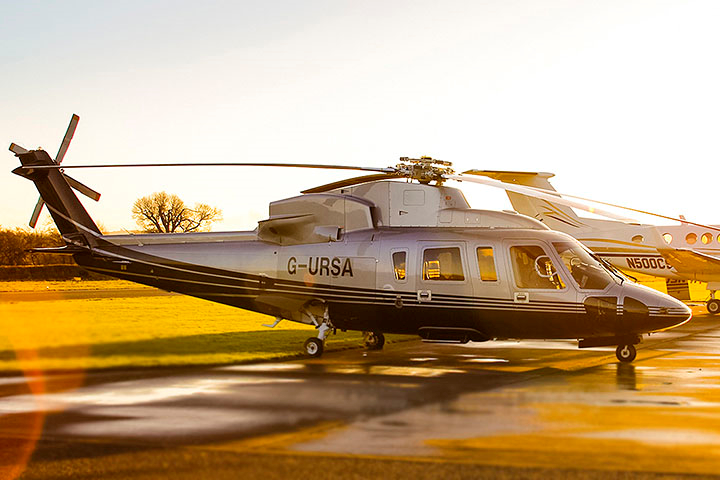 Chartering a private helicopter as a form of executive travel facilitates a more productive working day, saving on time spent travelling to and from meetings and, most importantly, getting home to family.